This week I broke out the old box of crayons. I'm not kidding when I say "my old box"...my name is written in poor penmanship, in pencil, on the back of the box. The box copyright is 1990. I'm pretty sure those 8 new colors aren't so new anymore. They may have been with me for awhile, but the crayon sharpener on the back of the box is just as lovely as always. (Remember how cool that pencil sharpener was? And how much it sucked when the bottom of the box would open up in your school desk?) Oh, and they still smell just as fantastic too. I've been keeping this box and paper on my desk at work during the day. I spend all day creating. Typically, when I need to think, find an idea, or work though something, I'll take to the internet and look all over the web for inspiration. I look at art, design, color, blogs-- all rather mindlessly until I work through my creative block in the back of my brain. Sometimes what I'm looking at sparks an idea; Other times just the break helps. It's my tried and true system. This week I've been replacing some of that mindless surfing with a little coloring. It's a bit more meditative. I try and really focus just on the colors and the act of coloring, and clear my head. Only a minute or two at a time, but it's pretty good for a quick recharge. I'm 3 days in, and you can see from the image how little I've gotten done. It's not a lot, but it seems just right. Regardless, it's been a nice change, and I have this wonderfully colorful piece of art to look at. :) Really, isn't it pretty?!? OH yeah, and it's so nice to be making marks on paper (that are not part of a to-do list). You can download and print your own copy from my pin here. I repinned from Pinterest and I'm not real sure where the original is (If you know, please help me and give me a link so I can give more proper credit). Looks like it's a design from Dover. They have some amazing adult coloring books that are quite affordable...Love that the pages of the books are perforated too. Will have to get some of those! (Sorry, I digress). 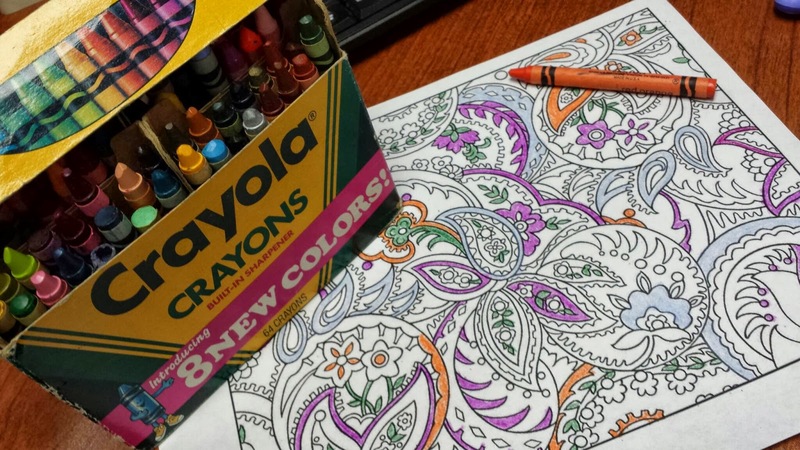 So- do you love to color?